There is perhaps no aspect of the Arab-Israeli conflict that is more complex and more emotionally charged than the problem of the Palestinian refugees. The atmosphere surrounding the discussion has led to confusion, so that the facts have become unclear and the problems more difficult to treat. This book, first published in 1981, examines the complex interlocking issues that surround the topic of the Palestinian refugees in the country that adopted most of them – Jordan. Introduction: Conflicting Aspirations and their Realization. 1. ‘Creeping Annexation’ – The Policy and the Response 2. Merger of Absorption? 3. 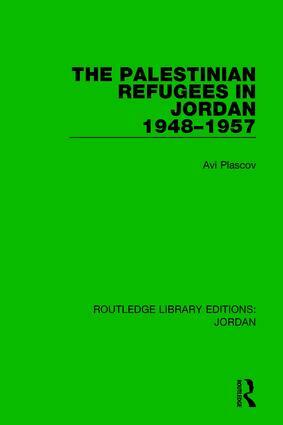 Jordanization of the Palestinian Refugees 4. Border Activity – Infiltration and Retaliation 5. Recruitment of Refugees into the Armed Forces 6. The Participation of the Refugees in the Parliamentary and Municipal Elections 7. The Political Parties and the Refugees 8. Refugee Demonstrations and Protests: Opposition to Whom?